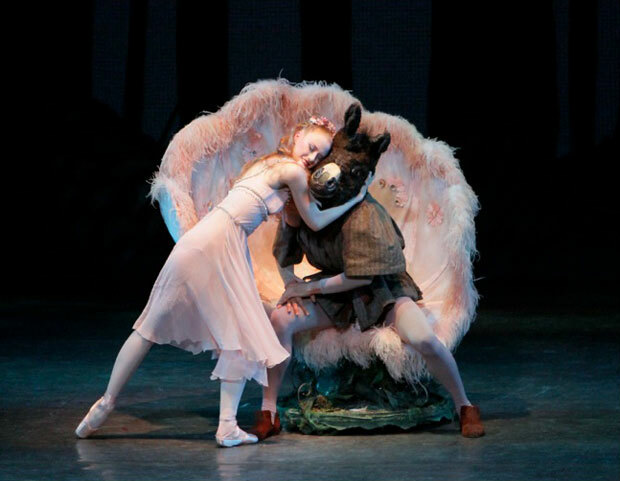 Teresa Reichlen as Titania, with Bottom (Henry Seth) in Balanchine's A Midsummer Night’s Dream. © Paul Kolnik. 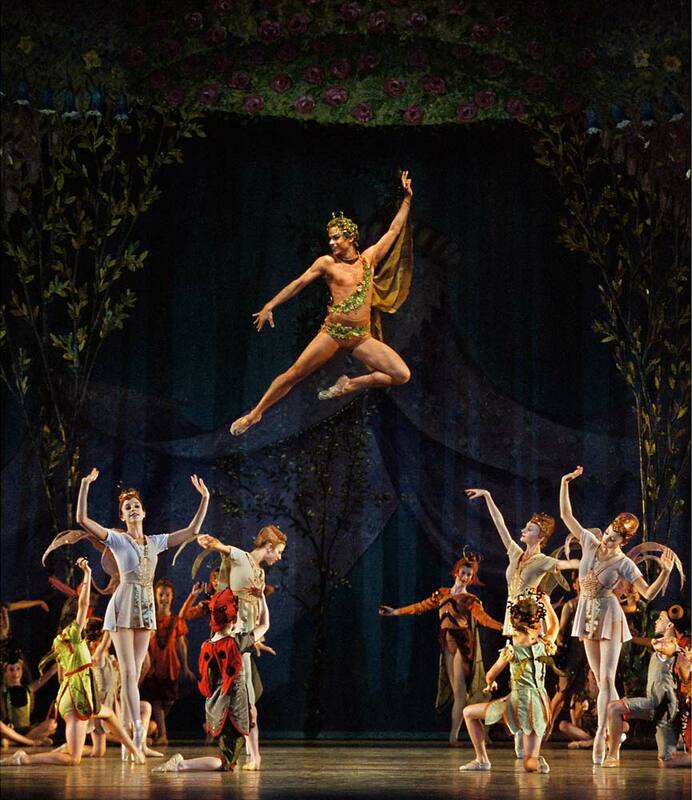 Is any ballet more suited to these balmy nights of late spring than George Balanchine’s “A Midsummer Night’s Dream”? The ending alone is enough to put one in a good mood. A courtly ballroom, decked out in pastel flower designs – a child’s vision of elegance, like the Land of the Sweets in “Nutcracker” – dissolves into a shadowy, nocturnal forest dell. We pass from light to darkness, from civilized formality to sylvan mystery, with magical ease. It is one of the most effective, stirring transitions in ballet. The stage is flooded with tiny bodies, waving their arms with all their might and skittering about in teeming patterns – oh, to be one of them! One minuscule girl, a virtuoso spinner, turns, and turns, and turns some more, then pauses, looks around – getting her bearings – and disappears into the scarf of children. Meanwhile, in the background, more children wave tiny lights, flickering between the trees: the fireflies are out. The impish Puck joins the forest sprites and then slowly floats above the fray, silently “singing” the final chords of Mendelssohn’s exhilarating music. Not a bad image to take with you as you leave the theatre. New York City Ballet just ended its spring season with a week of performances of “Midsummer.” When Balanchine made it in 1962 it was his first completely original evening-length ballet for the company. (“The Nutcracker,” created in 1954, was based on the version he danced as a child.) He interwove various strands from Shakespeare’s play, beginning with a petty quarrel between Titania and Oberon (king and queen of the fairies). One might describe them as an “estranged” couple, though, for the most part, they remain on polite terms. But they never dance together, and seem to lead fairly independent lives. There is something both regal and sad about this arrangement. The opening section of Balanchine’s ballet, set to Mendelssohn’s irresistible overture, is a marvel of economy. (How is it possible, by the way, that Mendelssohn composed this overture when he was only seventeen?) In quick succession, Balanchine introduces a slew of characters and interconnecting storylines, skipping forward and backward in time as if this were no problem at all. First, we see Titania and Oberon facing off with their respective retinues, and their quarrel. Balanchine shows it to us twice, as if to underline that this is a story about discord and folly. After the quarrel we see Nick and his band of bumbling actors, frolicking together; then Theseus, Duke of Athens appears with his beloved, Hippolyta, Queen of the Amazons. And finally the mis-matched lovers amble in. As the overture ends, Helena, Demetrius’s jilted lass, wanders sadly through the forest, lost in melancholy thoughts. A cluster of tiny sprites encircles her as she plucks a leaf from Puck’s hand and strokes her face with it. Fairies and common mortals share the same space but never quite touch: an invisible line separates their two levels of reality. (Similarly, the fairies do not enter the courtly realm of the second act.) The twelve minutes of the overture contain an entire ballet, exhilaratingly vivid and furiously paced. In fact the entire first act is action-packed; except for a rambling pas de deux for Titania and an un-named cavalier (the least interesting part of the ballet, in my opinion), not a moment is wasted. The lovers succumb to Puck’s mis-applied love potion; they pine, suffer, and fight. Hermia and Helena pull at each other’s hair; the men draw swords. Oberon (a role made for Edward Villella, a phenomenal jumper with lightning-fast feet) is an appealing character despite his vanity, handsomely clad in a shimmering gold tunic with hair to match. He dances a fleet-footed solo into which Balanchine has thrown every tricky step in the book – beaten jumps that merge into turns that evolve into split jumps – while removing all transitions between one step and the next. It’s a killer, and one watches the whole thing with amazement, breathing only in the breaks between one sequence and the next, when the butterflies have their turn. With the help of the magic potion Oberon tricks Titania into falling in love with Nick Bottom, whose head has been replaced with that of a donkey by Puck. 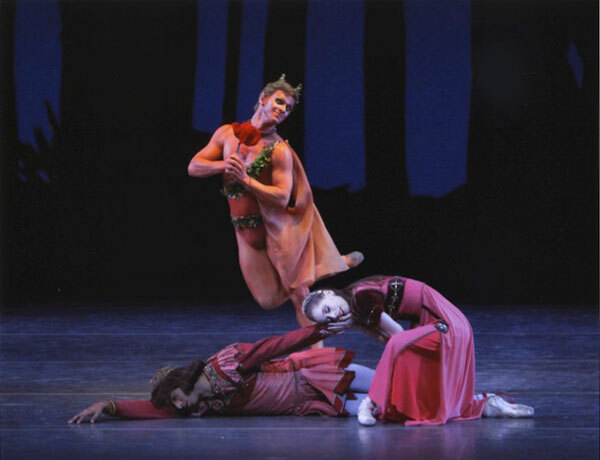 Thus begins a touching, tender pas de deux, in which Titania tickles Bottom’s chin, places a crown of flowers on one floppy ear, and entices him with fresh-cut grass. Smitten – both by her womanly charms and by the delicious grass – Bottom partners her as best he can, with clumsy bent legs and the occasional pause to scratch an itch. Balanchine sets this duet to one of the loveliest passages in Mendelssohn’s incidental music (composed sixteen years after the overture). Even this mis-matched love has its lyrical side. Love is love, after all. By the end of the first act, Balanchine has sorted out everyone’s love troubles. Now it’s time to celebrate. In the second act, storytelling gives way to pure dance, the highpoint of which is one of the most delicate, poetic pas de deux ever made – an allegory of love, danced by an unidentified couple. It is a Balanchinean vision of absolute trust and partnership, but also of freedom. A love beyond passion, a blissful understanding. These two bring out the best in each other; he gives his partner all the space she needs to show her radiance, while at the same time allowing her to glow even more brightly through his subtle support. He lifts her – not too high, mind you – and she taps her ankles together delicately to the front, then again to the back; then they repeat these floating lift in a circle, all with exquisite slowness. In the climax, she turns – again, slowly – with one leg extended behind her and her arms open, and they trade hands, over and over. She knows he’s there, and she doesn’t even have to look. I saw two casts. In the first Maria Kowroski was a regal, gorgeously long-limbed, but reserved Titania, lacking in focus; Teresa Reichlen was more lush, more warm, more responsive to the world around her. She was ravishing when she fell asleep in her shell-shaped throne, and even more so when she awoke and found Bottom resting at her feet. Her smile could melt a stone. (She was also a serenely unflappable Hippolyta in the first cast, leaping into the mist with friendly fierceness.) Joaquín de Luz’s Oberon was crisp, musical, with twinkling feet; Andrew Veyette’s had a note of roughness and urgency that worked well for the most part, but his landings were hard. Of the lovers – both casts were the same – Janie Taylor’s Helena was the most affecting. As usual, she danced with great abandon, hair and limbs flying, body wracked with sobs. As is his tendency, Amar Ramasar took the cartoonish qualities of his role (Demetrius) a little too far; Robert Fairchild was charmingly dumb as Lysander, exhibiting great comic timing. He’s a ham. The least compelling was Abi Stafford’s Hermia, prim and contained. Of the two Pucks, I preferred Sean Suozzi, who resisted the temptation to make the character too cute; Daniel Ulbricht’s jumps are bigger and his runs faster, but he has reduced the character to something out of a Tom and Jerry cartoon. And what of the all-important couple in the second-act divertissement? They could not have been more different. Wendy Whelan started out the act with some wobbles, but pulled herself together for the pas de deux. She may be in her waning days as a technician, but her sense of poetry radiates all the more fully. She has nothing left to prove, so she just dances. The duet became a conversation between two friends, with Jared Angle as her co-conspirator, a collaboration in which neither revealed the source or mechanics of the movement. Each step came as a surprise. In the other cast, Tiler Peck, whose début this was (with Tyler Angle), began her voyage into the role. She danced it beautifully, expansively, lyrically, with her usual sensitive musicality and a luscious upper body. It was gorgeous. But the choreography had not yet been sublimated into something ineffable, spiritual. But there’s time. Always enjoy your reviews. Hope you will be reviewing the ABT McKenzie show from Tuesday night. The dancing was incredible and the short films fun and well done. thanks for your note! Unfortunately, I was unable to go to the McKenzie tribute–I was across the plaza at Australian Ballet’s opening program. This time of year is brutal–not that I’m complaining!